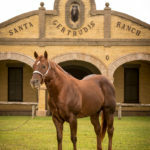 Bubba” wears the legendary Running W brand with style and exhibits that deep red sorrel color so typical of the King Ranch horses, passed down from Old Sorrel himself. Many of the sires and dams on his papers are written up in the “Legends” books, so it is no accident that he has the looks and the disposition to complement anyone’s breeding program. 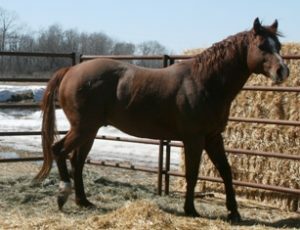 And he may be the only King Ranch-bred stallion in Canada! Thanks to Gould Ranch(Blaine & Lois Gould) for allowing us to own this young stallion. PLAY RED, $136,088: split 4th NCHA Super Stakes Open Classic; 5th Polo Ranch Cutting 4-Year-Old Open Derby; Abilene Spectacular Non-Pro Classic Co-Reserve Champion; finalist in the NCHA Non-Pro Derby; El Cid Cutting 4-Year-Old Non-Pro Co-Reserve Champion. 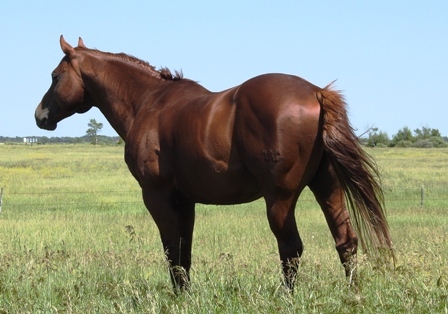 The sire of PLAY RED SALLY ($5,184 and 16 AQHA points: and 14 novice points: AQHA World Level 2 Amateur Barrel Racing Reserve Champion), ROYAL RED PLAY ($90,820: NCHA Western Nationals Non-Pro Champion). 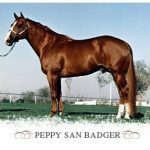 Peppy San Badger (1974–2005) was an American Quarter Horse stallion who won the National Cutting Horse Association (or NCHA) Futurity in 1977 and the NCHA Derby in 1978. He was inducted into the American Quarter Horse Association's (or AQHA) Hall of Fame in 2008.